In October, right before I left for Japan, I did a sneaky pre-birthday trip to Valle De Guadalupe, Mexico with my bestie. An early celebration with her was mandatory. I dreamed about staying at Encuentro Guadalupe since the first time I saw an image of the property. I tried to make a reservation many times throughout the years but it was always fully booked. They only have a handful of rooms so you’re lucky if you can manage to get a room! I was stoked to do a press trip to the property and my expectations were over exceeded! This architectural masterpiece itself is nestled in the heart of Valle De Guadalupe – which is only 2 hrs from San Diego, even less if you’re close to the border. It was so nice to take a break from the hustle and bustle of the city and just enjoy the resort…it was all too tempting not to. We enjoyed the property so much that we didn’t want to leave, so we stayed and relaxed the whole time 🙂 We were planning to check out the wineries and hip restaurants in the area but we really didn’t need to. We had our breakfasts and pre-dinner appetizers and roses at the restaurant by the pool area and dinners at the main restaurant of the hotel, overlooking the vineyards. It didn’t take us long to feel at home at Encuentro Guadalupe – we were spoiled with a minimalist modern eco-loft that made you never want to leave. I mean, who doesn’t love a good designed hotel? Talking about design, no wonder it’s one of the most instagram-able places I’ve ever stayed at! This eco-friendly luxury resort stilts on a mountainside among mammoth rock formations and it has definitely drawn global attention. It was named Best Small Hotel on Travel + Leisure’s Design Awards list(2012), Best of Year by the Interior Design Magazine in 2013, and included by Conde Nast Traveler Hot List 2013 as one of the Best New Hotels in the World. Upon arrival, we parked our car at the entrance and were greeted with sangrias at the lobby. A shuttle picked us up and drove us to our room since the private rooms are not accessible by car. Our eco-loft had a very enchanting vibe. It was housed in an individual, converted container that is perched above the valley with a unique view of the surrounding panorama. We had a private deck with an on brand seating area and fireplace which we declared the perfect wine sipping area that doubles as the perfect spot to take in the views during the day and starscapes at night. It gets really chilly night – even in October – so you’ll definitely need to use the firepit if you’re a fan of watching the stars while sipping on amazing wine in your deck late at night. Our loft also had black walls which we thought was very unique. I love charming details at hotels. And our bed was by far the comfiest bed I’ve ever slept in!! I absolutely loved how private the cabins are. We had to walk a short distance to get to the main road where the shuttle picks us up every time we want to leave our room and go somewhere. We definitely took advantage of this area and natural background with rock formations and took a bunch of outfit photos. The hotel offers free continental breakfast and it was by far the best continental breakfast I’ve ever had. Fresh fruits, granola, bread, jam and coffee is all that I need for a refreshing and instagram-able brekkie while on vacation. The delicious breakfasts and the quiet and peaceful energy of this part of the property were one of the highlights of our stay. It was very relaxing to have breakfast with a nice view of the vineyards and the pool. We spent a lot of time by the pool. Every morning for breakfast and sunset/rose time hangs. As I already mentioned, we haven’t been to any wineries in the area except the hotel’s own winery. Well, we actually didn’t even need to leave the hotel at all because why would we? 🙂 They do daily tours of their winery so we decided to do that. While waiting for our guide, we snapped a couple of shots of the lobby and restaurant. The winery is small but nicely decorated. I definitely prefer boutique everything over chains and the size is perfect for meetings or small parties and wine tasting gatherings. Our winery guide told us that Rihanna rented out the whole property for her birthday party last year! Definitely putting this on my bucket list  I really like that the hotel has 20 minimalist cabins because it makes the stay very intimate and private. The relaxing and romantic vibes of this hotel makes it an undoubtedly chic and on brand choice for honeymooners, and we definitely spotted some while we were there. Even if you’re just in the area to check out a winery or a great restaurant with an enchanting view and delicious affordable food, Encuentro Guadalupe is a great choice! Did I mention the staff was incredibly friendly? You can expect a real break from normal life at this beautiful retreat. 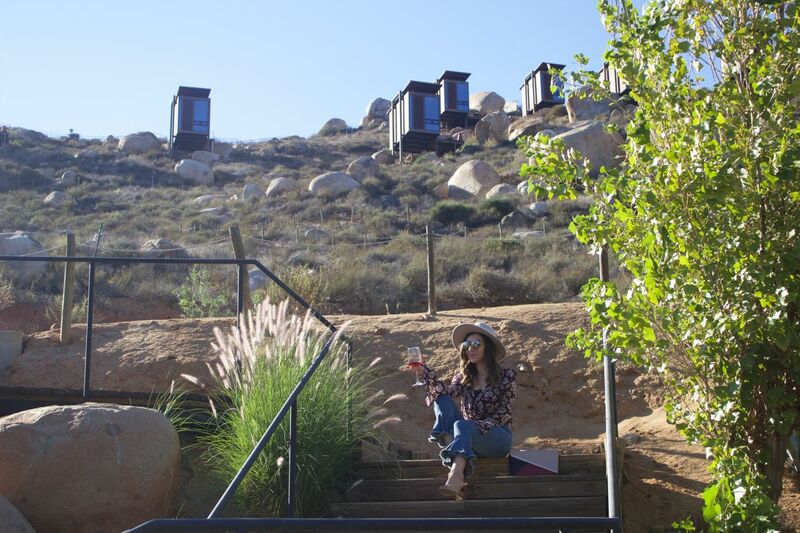 If you are looking for something a little bit different than your typical resort for your next vacation, I highly recommend booking a trip to Valle De Guadalupe and indulging in this utterly beautiful and chic hotel.